The Landessammlungen Niederösterreich, the Erich Sokol Privatstiftung Mödling and ourselves jointly awarded the SOKOL Award for Digital Caricature, Critical Drawing and Satire at the Cartoon Museum Krems on September 20th, 2018. Prizes were awarded in the following four categories: the SOKOL Sponsorship Award, the SOKOL Special Achievement Award or Lifetime Achievement Award, two AIR-ARTIST IN RESIDENCE scholarships for digital submissions as well as the main award, the SOKOL Award for Digital Caricature. The US-based caricaturist Thomas Fluharty was awarded the SOKOL award for digital caricature. He has designed covers for the satirical magazine MAD, and the magazines Spiegel and Time. His Time magazine cover was ultimately acquired by the National Portrait Gallery collection. Fluharty has also worked for People, Entertainment Weekly, Sports Illustrated, The Village Voice and the New York Times. His portrayal of Hillary Clinton earned him a gold medal from Spectrum Fantastic Art. The 3 × 3 Magazine of Contemporary Illustration honoured him for his book cover design for Max Lucado’s The Boy and the Ocean. Fluharty is also a passionate teacher who instructs students from all over the world in drawing and painting at the online art school Schoolism.com. Thomas Fluharty will be taking home the glass SOKOL award statuette and prize money in the amount of 11,000 Euros. The 11,000 Euro SOKOL Special Achievement Award or Lifetime Achievement Award went to Sebastian Krüger, who lives in Germany. He studied free painting at the University of Fine Arts in Braunschweig and quickly made a career for himself as a cartoonist and illustrator for magazines in Germany and abroad and also designed and illustrated record covers. He largely gave up working commercially in 2005 and devoted himself to a photorealistic portrait style that is often referred to as New Pop Realism. He considers himself a portrait artist who makes a careful study of his models. His picture series "FACES" can be considered a subversive homage to the world of beautiful appearances and rock and pop culture. It explores the dialectics of identity and pose, authenticity and glamour. His work is in high demand amongst collectors around the world and attracts countless visitors during exhibitions. The 4,000 Euro SOKOL advancement award went to Nadia Khiari, a cartoonist, painter, graffiti artist and art teacher, born in Tunisia in 1973. She became known as a graphic chronicler of the Tunisian 2010/11 “Jasmine Revolution”, the upheavals of which were central to starting the Arab Spring protests. Her best-known cartoon character "Willis from Tunis" is a cat, who offers biting commentary dotted with black humour surrounding the events during and after the revolution. She got the idea during long-time president Zine el-Abidine Ben Ali’s last televised speech, who has since fled into Saudi exile. Willis currently has more than 49,000 followers on Facebook. Her drawings, which have garnered her countless awards, regularly appear in the satirical magazines Siné Mensuel and Zélium as well as in the weekly magazine Courrier international. Frank Hoppmann and Ramize Erer were awarded the two AIR-Artist in Residence Lower Austria scholarships for a study period in Krems/Lower Austria. Born in Germany in 1975, Frank Hoppmann studied design at the Münster University of Applied Sciences with a focus on drawing, illustration and printmaking. 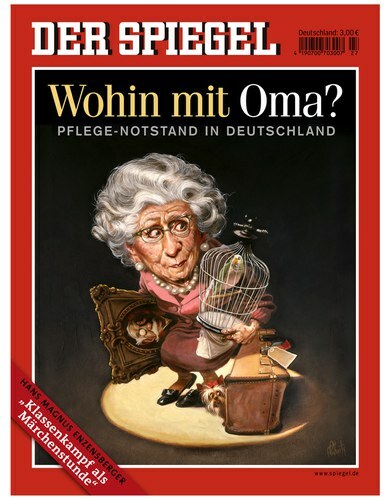 His work has been featured in the satirical magazine Eulenspiegel, Welt, Welt am Sonntag, Münstersche Zeitung, Rolling Stone, the Los Angeles Times, Handelsblatt and many more. More and more artists are working with digital technology throughout the world. Caricatures and cartoons are also drawn, digitally coloured and published by means of computers, in addition to traditional techniques using pencil, ink or acrylic. SOKOL supports this artistic development with an innovative and future-oriented prize. The SOKOL prize is advertised via our digital channels every five years and awarded in the following year. The work of qualified artists is evaluated and discussed according to their quality, political and innovative spirit as well as their medial realisation. Under the patronage of Annemarie Sokol, an international jury nominates the nominees and appoints a winner. As of 2017, the prize will be advertised internationally every five years, mainly via digital channels and social media, and awarded the following year. It is aimed at artists internationally who want to showcase their digitally and traditionally created caricatures in museum and scientific settings. Artists, students and artistic or graduates of an art or graphics education as well as artistically active persons locally and from abroad who are 18 or older can participate. The choice of topic is up to the artist. Deadline for submission: begins March 29th 2017 and ends on January 1st 2018, 8 pm (CET). AIR-ARTIST IN RESIDENCE. These include free accommodation in a studio apartment in Krems for two months each (value of the apartment/studio rent is over EUR 2,000,-), a monthly subsidy of EUR 1,300 each and personal on-site support. Austrian artists are excluded from being granted scholarships. 1. The documents to be submitted must be submitted by the participants no later than 1.1.2018, 8 pm (CET) to the following e-mail address: sokol_prize[at]karikaturmuseum.at as a portfolio in data form (format PDF, maximum file size 5 MB) or as a link to an online portfolio or to a homepage, gallery or Facebook page. The portfolio must include at least four and a maximum of ten projects, and should preferably be from the last two years. Please do not send originals, as they will not be returned! No liability is assumed for sent originals. The submission documents should also contain a one to two-page curriculum vitae, including the following: first and last name, date of birth, professional title, address, e-mail address, telephone number, bank account details. Submissions can be made on invitation and by ones own initiative. 2. Entries which do not meet the requirements of this call for submissions will not be considered further. There will be no further notification about non-consideration. 3. The submissions will be viewed by an independent jury after the deadline has expired. The expert jury has up to 15 members. An evaluation of all submissions is made by the individual members of the jury, which assesses independently and online according to a predetermined point system. This preliminary selection procedure will be completed by February 15th 2018. The participants with the highest score will be nominated for the award ceremony (about 15 participants) and the nominees will be notified separately by e-mail. The portfolio of the artist is assessed primarily. Besides achieving the submissions target and the creative idea, the focus for the most important criteria is on the particular degree of originality, the quality of the drawing, the political informative value, the innovative spirit and the medial realisation. The votes of the expert jury are not made public, the result is definitive and can not be challenged by law. 4. Subsequently, the submissions of the nominated artists will be showcased at the Erich-Sokol exhibition in the spring of 2018 in a separate exhibition space in the Caricature Museum Krems. Here, museum visitors can help determine the prize winners by submitting their vote via modern visitor interaction. This crowd voting is equivalent to one jury member's vote. In the autumn of 2018 the winners will be chosen according to the jury's decision. The expert jury is also allowed to propose artists for the competition. 5. Following the jury’s decision, the winners will be promptly informed by e-mail. Aside from the nominees, other competitors will not be contacted personally. 6. The prizes will be awarded in the autumn of 2018 by Annemarie Sokol, the late artist Erich Sokol’s widow. The prize-giving ceremony will be held at the Erich-Sokol exhibition in the Krems Cartoon Museum. 7. Caricature Museum Krems is aimed at a heterogeneous and diverse group of visitors, including children. It is entitled to exclude submissions with inhumane and discriminatory content from participation in the competition. The organizer has no obligation to communicate reasons for exclusion. Participants attempting to disrupt or manipulate the course of the competition or who violate effective law or the rights of third parties will also be excluded from participation. Under the patronage of Annemarie Sokol, an international jury decides whom to award the prizes to. 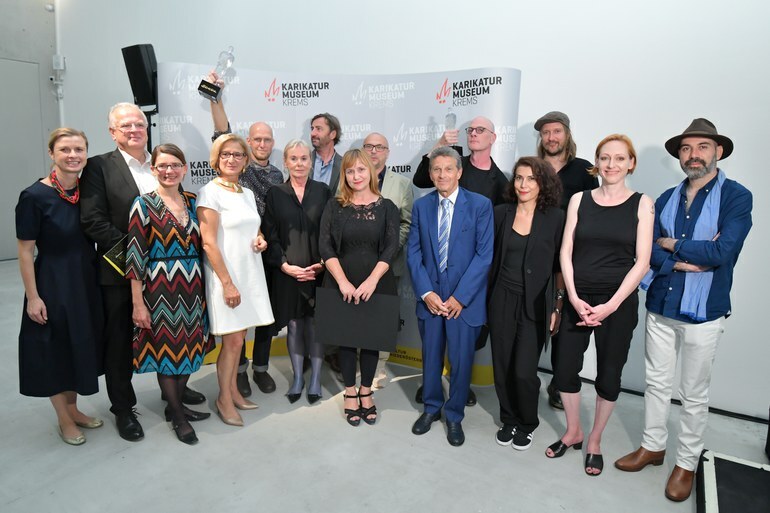 The jury is made up of 15 experts, from the fields of caricature, media, online publishing, and of representatives of Mödling’s Erich Sokol Private Foundation, as well as Lower Austria’s art and culture department and the Caricature Museum Krems. The Caricature Museum Krems reserves the right to change the number of jury members and its composition. The contestants must be creators of the submitted works and thus authors in the sense of § 10 (1) of the Copyright Act, BGBI. No 111/1936, as amended. By submitting a portfolio to the specified e-mail address, the artists authorize the Caricature Museum Krems to forward the work to the jury members. In addition, should contestants receive a nomination for the Sokol Prize for digital caricature, critical drawing art and satire, contestants agree to grant to the Caricature Museum Krems the right to exhibit the nominated work(s) free of charge, and to allow use of these in the context of the exhibition and the awards ceremony. This includes the release and use of the work in the context of reporting, documentation, publication and for advertising purposes. The unimpeded use in terms of time and context, as well as free and unlimited reproduction rights for the catalogue, public relations and marketing (including the Internet, social media, Facebook, non-commercial apps) and the exhibition transmission for documentation purposes after the end of the exhibition are also deemed to have been granted with the submission of documents as long as the participant has not expressed otherwise in writing. The contestant must be named as the creator whenever their work is used. Furthermore, in the case of a nomination, the potential award winner expressly consents, with their submission, that their data may be used in accordance with the provisions of the Data Protection Act 2000, BGBI. I No. 165/1999, as amended. The organizer reserves the right to exclude contestants from the competition who violate the conditions participation. Rights are compensated for with the prize money. Additional cost replacement or expense compensation will not happen. The competitors who don’t win will receive no compensation. By participating in the competition, all participants agree to the terms of this announcement.